One quart green cucumbers (cut lengthwise), one dozen small cucumbers (whole), one dozen small onions, one large cauliflower, one quart small green tomatoes. Put the cucumbers in brine for three days; the rest scald in salt and water; add pepper and other spices to taste. Two and one-half quarts vinegar, two and one-half cups sugar, one cup flour, six tablespoonfuls mustard. Scald the vinegar, sugar, flour, and mustard. Pour this over the whole bottle; and seal. 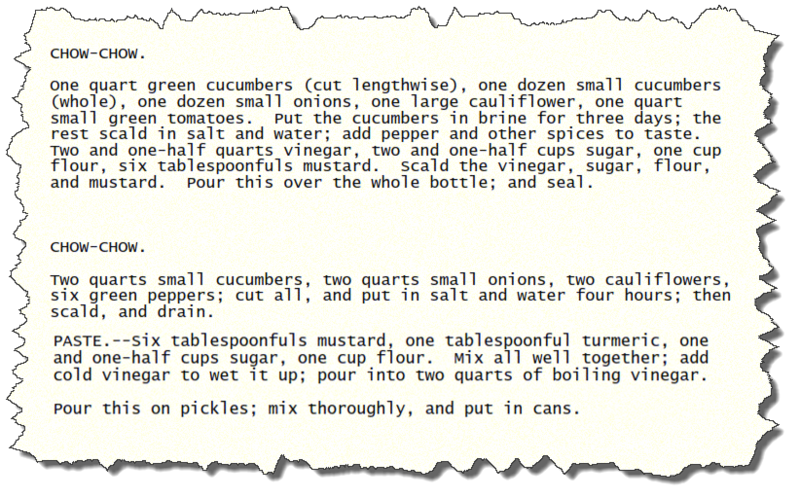 Two quarts small cucumbers, two quarts small onions, two cauliflowers, six green peppers; cut all, and put in salt and water four hours; then scald, and drain. PASTE. Six tablespoonfuls mustard, one tablespoonful turmeric, one and one-half cups sugar, one cup flour. Mix all well together; add cold vinegar to wet it up; pour into two quarts of boiling vinegar. Pour this on pickles; mix thoroughly, and put in cans.